So the purpose of this blog is to put those tools to work in my life. 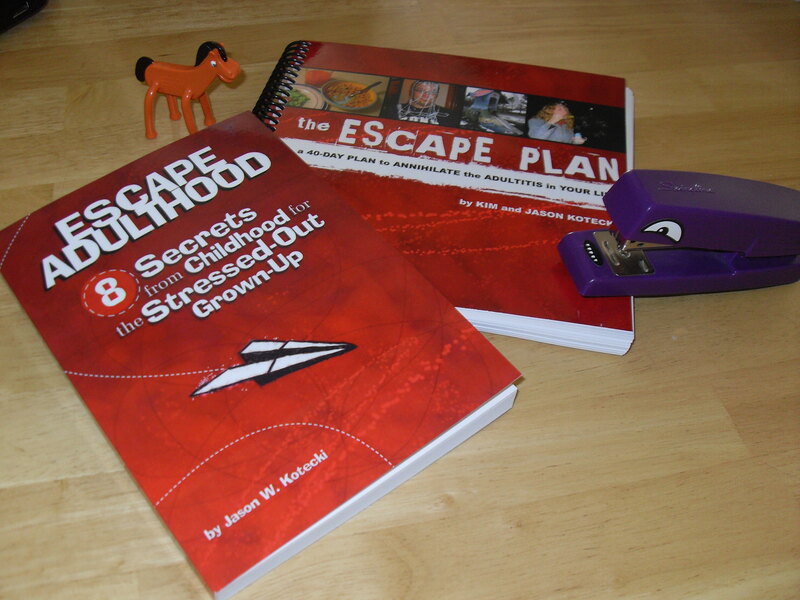 One great resource I took from the conference (actually I bought it, I didn’t just take it) is Kim and Jason’s book “The Escape Plan” which details 40 challenges that will help cure me of Adultitis. I hope you’ll join me on the next… however long it takes me to complete all 40 challenges (it’s supposed to be 40 days, but finals are coming up). I hope you’ll even take the challenge along with me. And please follow their blog and check out their really cool stuff. You may be looking at this picture and thinking “is that Pokey?” Yes. Yes, that’s Pokey. Why? Because. How serious is Amy’s case of Adultitis? What has led Amy to contract Adultitis? What sorts of childlike things are already in place in Amy’s life that have kept her from Full-Blown Adultitis? What does Amy look like? Inquiring minds what to know. Stay tuned! Posted in Mental Health, Uncategorized and tagged adultitis, home remedies, humor, inspiration, mental health, wellness. Bookmark the permalink.